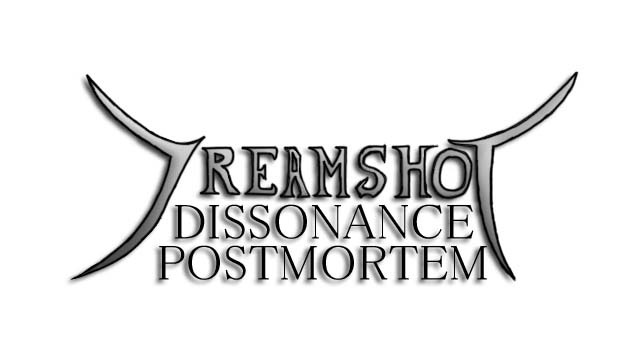 In this postmortem, I'll be writing about the things that went right and wrong during the development of Dreamshot Dissonance. Many of the game's problems can be attributed to lack of development time. Because the game was made for a game design class, there was a hard deadline set in place. The game went from concept, to prototype, to release in the span of eight weeks. Even though that sounds like a lot of time, during those eight weeks we also had to balance assignments from other classes on top of assignments from the same game design class. The lead programmer also had a lot of trouble working with GameMaker: Studio. GM:S uses its own proprietary language, GameMaker Language, and none of us were familiar with the software, let alone the language. This meant we had to spend a good chunk of our precious eight weeks learning how to use GM:S. The drag-and-drop system of GM:S didn't work well for us, and we eventually wrote our own bullet-hell engine using GML, but that too was buggy. Near the middle and end of the development, we encountered some issues with balance. We wanted the game to be hard, but accessible, so the game would function as a gateway to the bullet-hell genre. This was when "hard" games like Dark Souls or Hotline Miami were becoming more popular and mainstream. However, our playtesters either found that the game was too easy or too hard. An obvious solution would be difficulty settings, but as we were inspired by the genre of hard games, we felt it would compromise the vision of the game. We ended up deciding to make the game slightly easier, but without adding difficulty settings. The lead programmer didn't want to code that part anyway, and honestly neither did I. Not to mention the time crunch. During the last days of development, we had finished creating all of the boss fights along with all of the assets required. However, the product we presented to the class final was actually a series of boss battles. Yeah, we literally had no in-between levels! It was only after our final presentation that we went back to finish the game for good. The levels had been designed on paper beforehand, but without proper in-game testing like the boss battles had, it was bound to be the weakest parts of the game. Looking back, it may have been better to just cut the levels completely and just have seven boss battles, instead of the four level/four bosses implementation. The gameplay concept for this game was simple - high risk, high reward. Encouraging risky play would wean players for much harder games in the bullet-hell genre, where the risky play in our game is a regular occurrence in others. We did this with the Lucidity/Serenity mechanics. Lucidity involves moving the player as close to enemy bullets as possible (also known as grazing). The more bullets the player grazes, the faster the Lucidity meter fills up. When maxed out, the player can trigger Lucidity to slow down all bullets on the screen, making it easier to dodge bullets and graze even more. This was the defensive playstyle that encouraged players to get accustomed to dodging a hail of bullets. On the other hand, there is the Serenity mechanic. Serenity builds up the more damage is done, and triggering Serenity greatly increases attack power at the cost of making the hitbox larger. Using Serenity requires the player to follow the enemy in order to shoot it, putting the player at risk of getting hit, but will absolutely melt the HP bars of the enemy. This was the offensive playstyle that encouraged players to chase after enemies. Combining the two results in a highly aggressive playstyle, and a very exciting experience as well. We really went all out with the music in this game. We were still inexperienced as composers, but the thought of composing an actual OST for a game was very exciting. Our main composer made some nice pieces in a short amount of time, while also being away in a foreign country. Our game was likely the only game in the class to have an original soundtrack that had a large variety of songs. Many of the other games only had one or two songs maximum, while we had ten (or eight, not counting remixes). Creating Dreamshot Dissonance was definitely a learning experience. As my first game ever released, I have learned about the design process, and was also able to practice my art and composing skills. It also helped develop the willpower and discipline needed for the development of Gate of Providence. In eight weeks, we took a concept and turned it into a reality. While it was not perfectly executed, it was a great learning experience, and in my opinion, not bad for a first game release. Unfortunately, I've fallen out of love for the bullet-hell genre, so I won't be revisiting or updating this game with any major updates.